Owning its own professional gaming league will make Blizzard a major player in esports. First, a little inside baseball in the gaming journalism business. After languishing on the auction block for years by Rupert Murdoch's News Corp., IGN - the behemoth gaming website I won't bother to link here - was acquired earlier this year by Ziff Davis. The plan was to shrink some of IGN's holdings to concentrate on the main brand, and part of that meant shuttering the IGN Pro League and cancelling its professional gaming event in Las Vegas mere weeks before it was scheduled to begin. Today, IGN announced Blizzard Entertainment has purchased all the rights and holdings of the IPL for an undisclosed sum. According to Blizzard's brief statement, present employees of the IPL will create a new team "whose primary focus will be on creating high-quality web and mobile content in support of Blizzard games." "This new team will help us to further develop the rich media experiences that extend the fun and engagement of our games online," said Blizzard executive vice president of publishing Itzik Ben-Bassat. "This is a team of passionate gamers with a proven track record, and we're looking forward to now leveraging their expertise and technology to support a variety of online efforts." 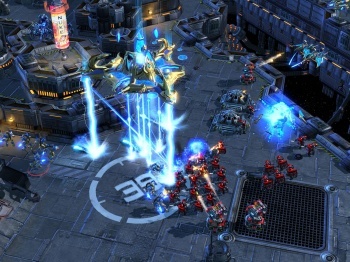 The implications for this acquisition are huge for Blizzard, whose StarCraft II is a big draw for esports events run by companies like Major League Gaming. Now that they have their own gaming league, it's possible Blizzard may concentrate on pimping more than just StarCraft in esports events like Arena PVP in WoW and the upcoming Hearthstone through events of its own. They could limit licensing for other gaming leagues to run their games so that they can more specifically control Blizzard branding through holding their own shows and events. That's all speculation though, honestly. The statement claims they will use the assets of IPL to create web-based content, which may mean the shoutcasting talent and streaming technology is what they were after. I've sent an email out to Blizzard's PR and I'll let you know if we hear any more details.